The blockade of coal supply from the temporarily occupied territories of Donetsk and Luhansk regions is a hot topic of last week’s political battles. 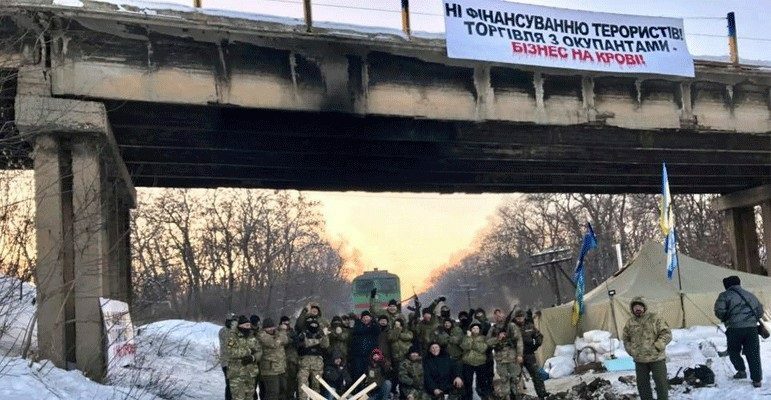 Activists and politicians have been blocking few railroad hauls in Donetsk and Luhansk regions since January. This have hindered the supply of anthracite for Ukrainian thermal power plants. The government announces rolling blackouts and summons Anticrisis energy staff and admits the possibility of power cutoffs in 7 regions. Blockade organizers give their reasons. Blockade activists say that trading with the occupied areas is equal to trading on the blood. To officially cease commercial activities, a respective law needs to be adopted, it will stop the flows of money to “DPR” and “LPR”. In their opinion, militants are getting their profits from commerce with Ukrainian companies. Why it is problematic for Ukraine. Half of the power plants in Ukraine are fed by anthracite coal, another half by gas coal. The two types are not interchangeable. There has been anthracite coal deficit in Ukraine since 2014. Anthracite can be supplied either from the occupied Donbas or import it from the Republic of South Africa, Australia, the US and Vietnam. Attempts to set up imports based on competitive price have not been yet successful. On February 13, Ukraine’s deposits of anthracite reached 842 thousand tons, those of gas – 688 thousand tons. Heat power plants working on anthracite are burning 30 thousand tons of coal daily. Should the blockade spread to other railway lines and continue in time, the reserves will be enough for 20-40 days. Why Ukraine should keep buying coal from the occupied areas – authorities present their motivation. Authorities are of the opinion that the blockade should be ceased as the country’s energy security is under a threat. Ukraine, indeed cannot generate heat and power it needs without domestic anthracite coal, that is extracted on the territories that the government currently does not control. Authorities also claim that they are not financing militants in such way. The coal is purchased from the companies registered in the government-controlled area. Coal mines de-facto located in the occupied areas are paying taxes to Ukraine’s budget, miners in the occupied areas get payment in hryvnia to bank accounts of Ukrainian banks. What the authorities keep silent about. The blockade is a reminder for the authorities to keep the energy reform going. For over one year now experts and civil society have been calling for transparency in pricing for coal and power generated by heat power plants. They have been also requesting the authorities to report on the steps undertaken, in order to gradually refuse anthracite coal. Respective program was adopted in 2015. Following adoption of this program, electricity bills have gone up. Part of the coal was planned to be imported in order not to depend on the supplies from the non-controlled areas. The government has yet to respond to accusations as to alleged excessive profits by Poroshenko’s team and Akhmetov’s companies. Rynat Akhmetov’s role. Anthracite power generation units account for about 15 percent of Ukraine’s electricity, and that is the exact part of the energy industry of Ukraine dependent on coal mining in the temporarily occupied areas of Donetsk and Luhansk regions. Back in 2015 a decision was made to convert anthracite power plants to gas coal. To get rid of anthracite dependency, Ukraine needed 2-3 years, and by summer 2017 the conversion would have been complete (excluding the rare cases of outdated units which are easier to destroy and replace with the new ones rather than convert to another power source). However, the state owns only 30 percent of Ukraine’s thermal power plants, while 70 percent of them are owned by Rynat Akhmetov’s DTEK company. Experts claim that Akhmetov managed to assure everyone that he was capable of providing the country with necessary amount of energy, while the use of anthracite coal from the temporarily occupied areas of Donetsk and Luhansk regions was allegedly his personal problem. That is why the conversion process was put on hold. Due to the tariff escalation motivated by the non-existing diversification of energy supply by the imports, Akhmetov’s DTEK remains a monopolist, earns super profits and keeps the country dependent on the anthracite from the temporarily occupied areas of Donetsk and Luhansk regions, while Akhmetov refuses to read out the formula for prime cost of coal. Experts suggest that the anthracite might originate from illegal mines and be even cheaper than the one from legal mining enterprises.